SuperPhillip Central has many reviews to share this week. 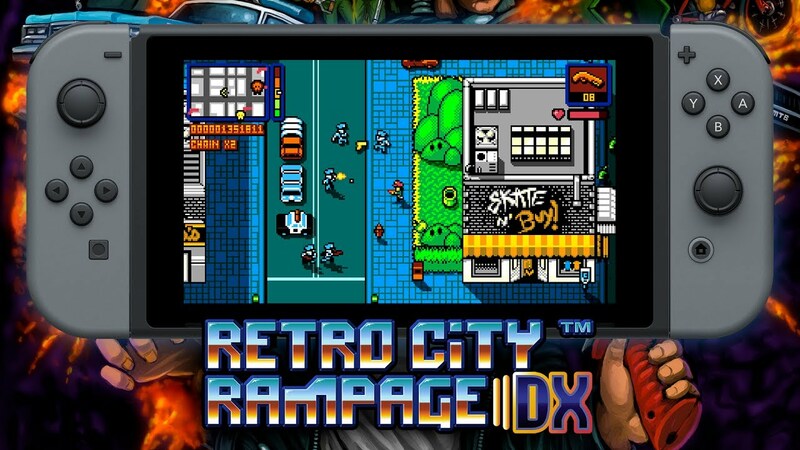 We begin this onslaught of opinions on games with my take and review on the Nintendo Switch port of Retro City Rampage DX. Here goes! We built this city on bits and blocks. Until now, I've never played any version of Retro City Rampage! GAH! There. I said it. After seven years or so on the market in various forms, this was my first time playing Retro City Rampage. It finally seemed like a solid starting point with the newly released and relevant Nintendo Switch version, so here I am. The console itself has been my go-to for indie games, as I love being able to play them on-the-go or at home while having the TV on the background as I play in undocked mode. I can definitely, 100% agree that the high amount of love and praise for Retro City Rampage and its deluxe incarnation (the latter being the review subject) is very much deserved. Still is, as you'll see with my own love and praise for the game. 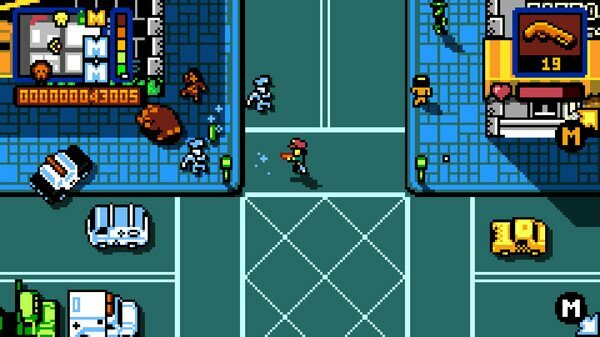 Retro City Rampage DX relishes in its ridiculousness and urges players to savor in its stupidity. The game really is just an excuse to drive around, plow into vehicles, shoot anyone without discrimination, and enjoy the game's fantastic missions and odes to games and pop culture of times past. The story is as simple as the rude dude with an attitude, named Player, being transported into the future, and now he must gather all seven pieces of the broken down DeLorean-esque time machine to return back home. Retro City Rampage never lingers on one particular thing. It's constantly shifting from mission to mission, story point to story point, all while never letting the player rest for a moment. The game doesn't try to be anything further than be a hilarious parody of video games and pop culture, particularly around the '80s and early '90s. Your mileage will vary depending on how many references you gel with. For me, I was busting a gut and giggling with glee from the opening ten minutes. 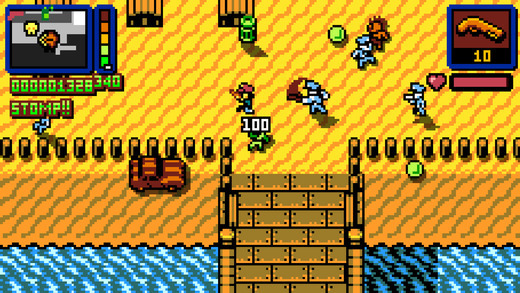 Whether it was the first major mission being a take on Metal Gear, a jump into a Teenage Mutant Ninja Turtles-like sewer with the same exact look of the super hard NES game, or notes given to Player on the same stationery that Princess Toadstool mailed to Mario at the end of each world in Super Mario Bros. 3, the references are certainly fun to find and point out. It's like its own game--seeing which references you can pick from the game. A game within a game! How meta! 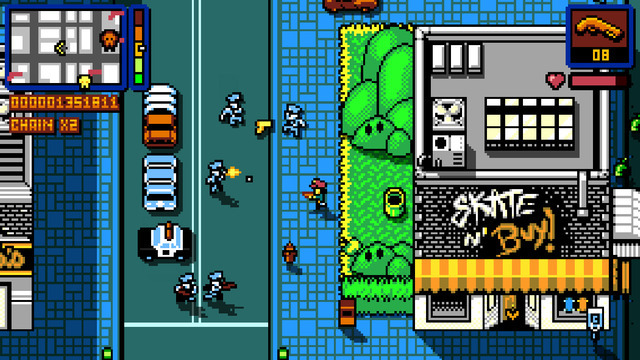 Not only that, but the devs have made Retro City Rampage DX a bit of a critique on multiple topics in gaming, such as indie developers and how big publishers take advantage of them, as well as the types of snobby gamers who look back on the classic gaming era with too much of a rose shade in their tinted glasses while trashing on anything modern. Player's Sunday stroll could have ended a bit more peacefully, but where's the fun in that? The story elements and missions involved borrow heavily from classic games and pop culture from the retro era. I mean, who wouldn't want to teach Duke and M.C. from Bayview High a lesson courtesy of school principal Mr. Balding? The basics of Retro City Rampage DX's gameplay also borrow heavily from another source, the Grand Theft Auto series--particularly the top-down 2D games. There is the thefts of automobiles, story-based missions to advance through the game, and side missions in the form of discovered waypoints have you try to get high scores by slaughtering as many people as possible in various ways under a specific amount of time. This slaughter mission requires you to beat a high score while piloting a colossal tank. The story missions themselves have you going from insane, ridiculous situation to another. ...And again, filled with references to retro gaming and '80s/'90s pop culture during them. There are missions where you take out pole dancers in a less-than-responsible gentlemen's club (if you know what I mean), go into the sunken deep in a familiar-looking dam where you must turn on five underwater bombs, and even escape from prison with only a cardboard box to help you. Some are a bit difficult, but where Grand Theft Auto failed in its early outings compared this retro delight is that Retro City Rampage DX hands out a gracious amount of checkpoints per mission. Thus, you're never really losing much time or progress when you ultimately get shot to death, blown up, drown, get beaten to a pulp, run over by a cop car, etc. If Retro City Rampage DX played by different rules in this regard and had no surplus of checkpoints, I probably would have bailed on the game. While this game does take a lot of retro classics, we're not renting these games from Blockbuster Video anymore, so NES-hard games aren't needed nowadays to keep our attention and keep us playing, death after death. browsing Skate 'n Buy and shooting at random people. While the story missions aren't too terribly long, nor will it take a lengthy duration of time to beat them, Retro City Rampage DX has plenty to see and do in Theftropolis. From those previously described "Rampage"-like side missions to finding loot boxes and payphones as collectibles, as well as unlocking all of the different playable skins in the game--Retro City Rampage DX has you covered long after the ending credits have been viewed. Bonuses like retro tints to the screen and a nigh unplayable but utterly hilarious "Turbo Mode" add even more to the good times of the game. Controlling Player is satisfying and feels good. Between aiming and shooting either by holding the shooting button or using the right stick to fire in one of eight different directions, you can adjust in the moment depending on what kind of crowd you're up against. The left shoulder button opens up your current arsenal of weapons--everything from pistols and machine guns, to rocket launchers and flamethrowers. The only drawback--but not with the controls--is that when you die exploring the free-roam city of Theftropolis, you lose all of your weapons, so be sure to use everything you can to attack, such as punching, shooting, and yes, Goomba stomping. Your skin might be protected by suntan lotion, but that stuff won't protect from bullets! 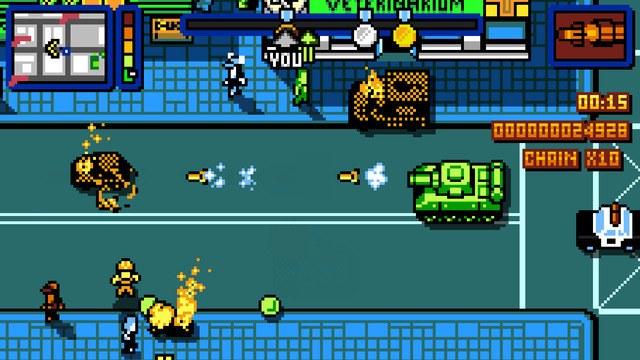 Retro City Rampage DX has all the trappings of an 8-bit game, though not all the problems. For one, the frame-rate is solid while the amount of characters on screen at the same time is much more sizable than possible on actual 8-bit hardware and games. There are other aspects that appear in Retro City Rampage DX in a graphic sense that couldn't be done on the NES. From performance to the sound, Rampage comes with a host of chiptune tracks, all working well to bring an experience as close to the late '80s and early '90s as possible. 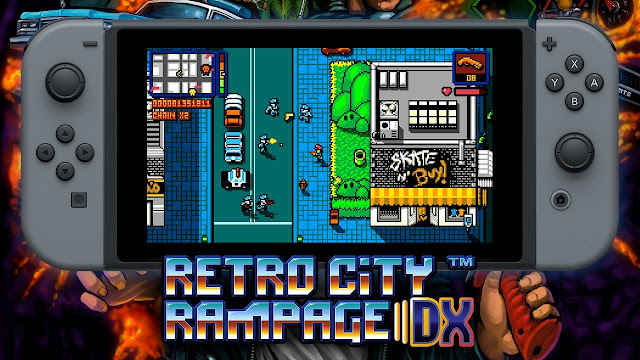 Overall, if you've not played Retro City Rampage DX despite all of its re-releases since its original launch, the game should definitely be on your radar. If you already have, however, perhaps the appeal of a version that you can play on a TV as well as take the game with you to the park, in the car, or even if it's just a different room in your house, will make sense enough to make this Nintendo Switch port worthy of a purchase. For me, I'm glad I finally got around to playing Retro City Rampage DX in one of its forms, and now also happy that I can wholeheartedly recommend it to others. Review code provided by Vblank Entertainment Inc.